Reminder: The Nisei Veterans Committee holds their annual Memorial Day ceremony in Lake View Cemetery — 10a. Senator Maria Cantwell is expected to attend. The South Shall Rise Again!, originally uploaded by Cowtipper. From the request of the Confederate veterans, Mrs. Wilkins ordered and received a 10 ton block of granite from Stone Mountain, Georgia, for the Confederate Monument. It arrived on the steamship Monticello coming through the Panama Canal. Edward G. Messett, of the Sunset Monument Company, and James A. Wehn, sculptor, were chosen to be the designers. Mr. Messett carved the stone and Mr. Wehn modeled the bronze insignia, cross of honor and crossed bayonets. As a gift, Mr. Wehn did the bronze plaque of Robert E. Lee’s head. Mr. James Wehn, the Seattle Sculptor, created most of the statutes around in the City of Seattle. Corner stone of the monument was laid on April 11, 1926, at 3:30 pm at Lake View Cemetery. Confederate Veteran Commander D.F. Dodge and Mrs. Bradley T. Fowlkes, Chapter President, placed the cornerstone with a box of chapter records sealed beneath it. Lead by Montgomery Lynch, the Temple Chorus sang. Mr. Scott Bullitt was the keynote speaker. Mr. Wehn gave a tea party at his studio. Private unveiling was held on Memorial Day with speakers which included Washington State Governor Roland H. Hartley, Seattle Mayor Edwin J. Brown, and Tacoma’s Mayor-Elect M. G. Tennent with leaders of Veteran groups from all over the state attending. Public unveiling of the monument was held on May 23, 1926, in Lake View Cemetery with the raising of General George E. Pickett’s battle-scarred 8th Virginia Battle flag from Gettysburg. It joined the United States Flag on the flagpole. Mrs. Norton’s great, great grandson since donated the Pickett battle flag to the Harrisburg, PA., Civil War Museum. Today, Robert E. Lee rendered in bronze is long gone as are any other adornments that could be peeled away. Not much sympathy for the rebels, these days. Just north of the monument outside the Lake View fence lie the graves of Union soldiers — and a few wives — who made their way west to Seattle. There’s mostly nothing to peel away there. If you decide to visit Lakeview, this site has a roster of some of the more notable graves. From the warrior end of things, you’ll find Granville Haller who battled Indians before his son became the namesake for Haller Lake, Asbury Haynes who won the Medal of Honor for literally capturing the flag and General Gilbert Meem who fought for the losing side in the Civil War and still managed to become a Seattle postmaster. In the meantime, here’s a list of what services are open/closed in the city today from the Seattle Times. And don’t forget free parking. Bronze Robert E. Lee would have wanted it that way. 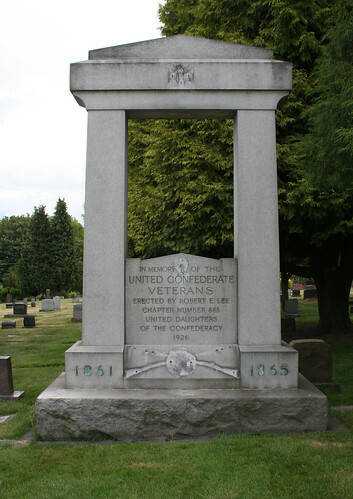 Thanks to Linder Seattle for the original information about the Confederate memorial. This may sound silly considering how much time has passed. Maybe it’s the northeastern transplant in me, or maybe I’m soured by the fact that I used to be called “Yankee” when in contact with white southern cowards who routinely threw around the “n word”, but only in private provided the audience was all white. But the Confedderacy does not deserve my sympathies. If they were alive today, the best excuse these men could have would be to make like Nazi soldiers and say they got caught up in the times, or they’re only following orders. Oh wait, it was about states rights, southern culture, mint juleps or something. Call me crazy, but somehow I feel much more comfortable with the assortment of Union veterans buried at Lake View. The way I figure there are still a lot of assholes in the south who act like the war is still going on (I know I have met some), so I might as well return the favor. That does sound silly, considering how much time has passed.